In order for crews to perform necessary track maintenance work, there will be no Green Line service west of Aviation/LAX Station this Saturday, July 29 from open to close of service. 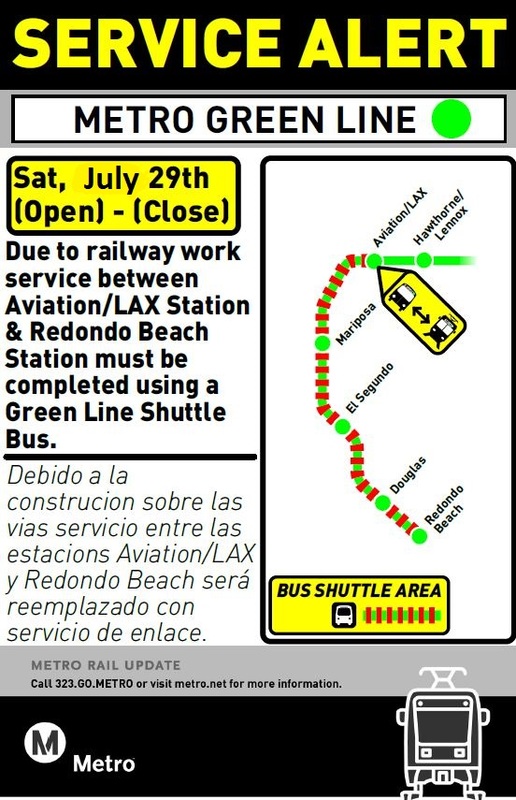 Metro bus shuttles will replace the Green Line between Aviation/LAX and Redondo Beach Stations while the work is in effect. This means all trains traveling towards Redondo Beach will stop at Aviation/LAX and turn back toward Norwalk Station. Customers wishing to continue westbound can board free bus shuttles downstairs to complete their trip. Green Line trains are scheduled to arrive every 15 minutes and buses will match the schedule as best as possible throughout the day. (Please note the schedule may be subject to work-related delays.) Normal service to all stations will resume with start of service Sunday. For those planning to take transit to LAX while work occurs, please allow extra travel time to connect with bus shuttles. We know the work can be an inconvenience, and we’d like to thank everyone affected for their patience. Metro personnel will be on hand to assist customers at all stations between Aviation/LAX and Redondo Beach. To stay informed on the latest transit news and service updates, please check the Service Advisories page or follow us on Twitter @metrolosangeles or @metrolaalerts.